The Ventura Vibe Rotary/Vibrato pedal from DigiTech will twist your equilibrium adding spinning, swaying movement to your guitar playing. It delivers both vintage and modern sounds with three rotary/vibrato effect types. Each can be uniquely contoured to accentuate high frequencies and driven to distort via the Ventura Vibe’s stacked Tone and Drive controls. The versatility of these controls along with independent Speed, Depth and Mix controls allow you to dial up anything from mild amplitude and frequency modulation to a full on case of vertigo. Additionally, the Ventura Vibe’s foot-switchable speed function allows you to ramp between slow and fast speed on the fly! The Ventura Vibe’s stellar rotary and vibrato effects are complimented by stereo ¼” inputs and outputs for routing flexibility, constant high voltage rails, a bicolor status LED indicator and true bypass circuitry. 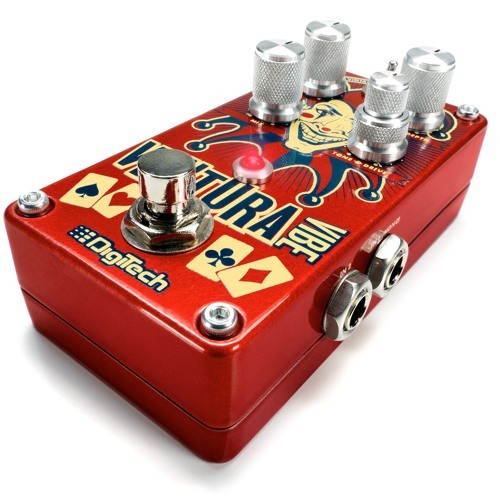 With its compact size, vacuum-style footswitch and striking graphics the Ventura Vibe furthers DigiTech’s evolution in pedal design. We’ve put years of experience into every detail of its mechanical and sonic blueprint. The Ventura Vibe uses a 9V DC power supply to easily integrate into your existing pedalboard. Billy plays the new Ventura Vibe. He demonstrates some darker tones available by using the tone control, as well as more transparent settings. He also demonstrates the alternating fast and slow speeds available by momentarily holding down the foot-switch, and the pretty-sounding accompanying inertial effect that is available in all modes. 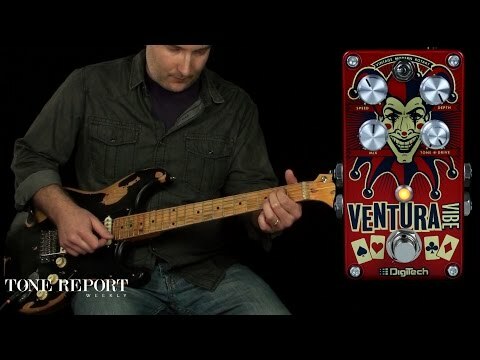 Buy Now: https://goo.gl/ziv4qe Today, we're checking out the Ventura Vibe, by Digitech. The Ventura leaves no stone unturned in its quest for pristine vibe sounds, and it features three modes to help you on your journey: Vintage, Modern and Rotary. Each mode is governed by five controls: Depth, Mix, Speed and a stacked control consisting of Tone and a unique Drive control, which controls how much grit gets into the signal. The Vintage mode is based off a Uni-Vibe, with more control than Shin-Ei ever intended. The middle position is a straight-forward modern pitch vibrato, with the ability to range from slight undulation to full-on seasick vertigo. Rotary mode gives players a very convincing Leslie tone, and the addition of the drive knob acts as the tube amp gain on an old Leslie cabinet. Each mode can be ramped up or down by holding and releasing the footswitch, drastically expanding the functionality without the use of any bulky expression pedals. The Ventura also features true stereo ins and outs for full integration into any rig, high internal voltage (headroom) and true bypass switching.